[Marcell] has always been turned off by the price tag of commercially available double flash adapters. He decided to see what kind of performance he could get out of a flash adapter which he built himself. The raw materials used should seem quite familiar. The optical fibers act as a conduit to redirect the light from the flash, but he needed a way to hold them in place. He chose to use locline. It’s a product we often see in CNC mill builds to blow debris away from the cutter head. It’s hollow, and holds its position. This is perfect because it allows for easy adjustment and provides a channel through which the fibers can be routed. The Y adapters used here run to a hard board base which connects to the mounting lug on the bottom of the camera. [Marcell] suggests using a T-piece if available because the Y fitting made it a bit more difficult to push the fibers through. Too bad they didn’t post any picture…. taken with the system. Check the front page of the blog. Thanks! Looks neat! I’ve been thinking about doing something of the like, but never put my hands on it thinking about “opening” the beam… nice idea with the reflector! Most probably I will improve my rim-light as a next project. 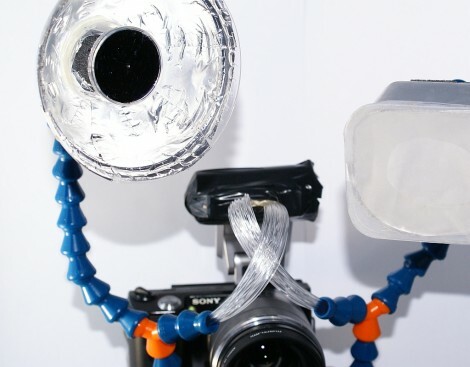 I want to make one for my underwater strobe (with a much better design).